Hi! My 1996 Buick Century is the 3.1L type and has 130,000 miles. My engine light is on with a code of P0172, System Too Rich. I don't know if this problem is related or not, but there is black goop coming out from underneath my engine. Specifically, it is on this part (the images zoom in to the part), and I don't know what this part is. The black stuff is oozing out from underneath the front passenger tire well... my wife keeps getting it on her leg. Her leg I can fix with tissues. The car, not so much. Any help? Thanks! I deleted your useless slideshow pictures. They are only visible for about a second each and are impossible to even view. If you want to post pictures, post one still picture at a time. Thanks for letting me know. I spent a lot of time making the slideshow because I thought it would be helpful, but I've changed it to pictures. I still don't know what it is that the pictures are supposed to be showing. 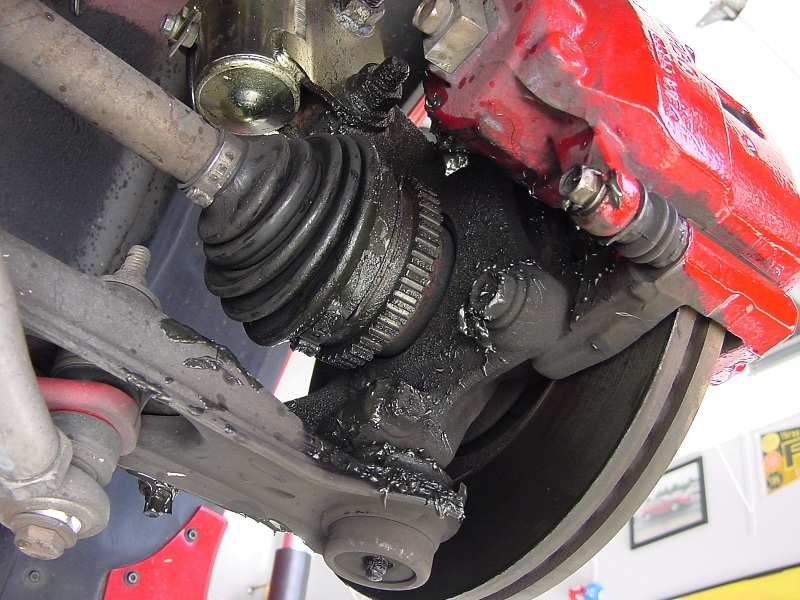 Looks like the axle is slinging grease. I'm sorry for the confusion. I don't know, either. I've been looking at schematics all day, but I just don't have enough experience with cars, and I just moved, so I don't know anyone, either. The part is directly under the engine. It's only visible in the last photo--the other two are only there to show you where it is located. It has a thick layer of black stuff; I don't think it's oil because it's very thick like grease. It could be. I don't know much about this, but it also appears that the grease is leaking out from a seal on the part that is circled. However, I don't know what that part is. I thought it might be the transaxle but I don't know. DS is probably right. It looks like one of the axle boots is broken and it's slinging out grease when it spins. You would have to replace the axle for a couple hundred dollars. Of course the black stuff maybe coming from the outboard joint and slinging around in the wheel well. How it gets on your wife's leg is kind of weird. Does she drive with her foot out the window? You know, I think you're right. I'm not sure I'm up to replacing an axle, but then again I just might try it! Your question made me laugh--I needed that! The grease slings up along the side of the car just underneath, which is why I hadn't noticed it before. I guess my wife used to slightly bump the car with her leg as she got in, hence the mystery grease lines. Thank you guys so much for answering. You're amazing. I'd recommend you for a raise, but there isn't any such button on the forums. Tell he it makes great skin cream.